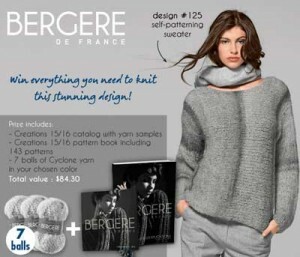 Bergère de France is having a giveaway with a prize including their catalogue, full of inspirational designs and hundreds of yarn samples to touch. The associated Creations 15/16 pattern book is included as well, featuring 143 patterns for women, men, children, babies and your home. Then you get to pick your color of Cyclone yarn! 7 balls are included in the prize package, which is enough for the largest size of the pattern shown above! This giveaway is open only to legal residents of the 50 United States, the District of Columbia and Canada (excluding Quebec) who have reached the age of majority in the participant’s jurisdiction of residence at time of entry. This giveaway begins on December 30, 2015 and ends on January 7, 2016 and you can enter once daily!! Click here to enter the Bergère de France Cyclone Yarn Giveaway! Good luck as always, and did you finish your Christmas knitting or, are you still trying to finish before New Years?? Share the post "Bergère de France Cyclone Yarn Giveaway"